Our complex has eight fully self-contained spacious, comfortable and clean 2 bedroom apartments with a 3½ Star AAA rating. It is located in a quiet cul-de-sac on the Fishpen, only 200m from the surf and with a 1km flat walk across the causeway to the town centre. Our eight 2 bedroom fully self-contained apartments sleep 4 people and are ideally suited for family holiday accommodation or couples. 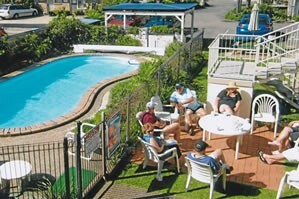 The apartments are very clean, comfortable and have everything you need during your stay. Each apartment has a queen bed in main bedroom and 2 single beds in second bedroom, a fully- equipped kitchen with stove, microwave, fridge and dishwasher, a bathroom with full size bath and separate shower, a laundry with washing machine and dryer and TV with FOXTEL and DVD player. The main bedroom has a queen size bed with independent reading lamps, electric blankets and good sized wardrobe. Second bedroom is perfect for the kids or extra adults, the second bedroom has 2 single beds with electric blankets and individual reading lamps. A foldaway mattress can be provided for an extra child up to 10 years of age. The tropical garden surrounds include a solar heated in-ground swimming pool as well as gas and electric barbecues, outdoor dining tables and a small children's playground. Off-street parking and a secure area for bikes, surfboards, fishing gear. At reception there is an extensive book library and tourist information. The track from Ocean Drive to Merimbula's Main Beach is just across the street. The walk to the beach takes less than 2 minutes. Situated between the ocean and the lake you are within walking distance of the town centre, boat ramp, beaches, airport, walking track to Pambula and the boardwalk around lake. Ocean Drive has a pleasant atmosphere and provides family friendly holiday accommodation with opportunity for guests to mingle. Linen is not included in the tariff but is available for hire @ $15 pp per week. Port-a-cots and high chairs available at no charge.